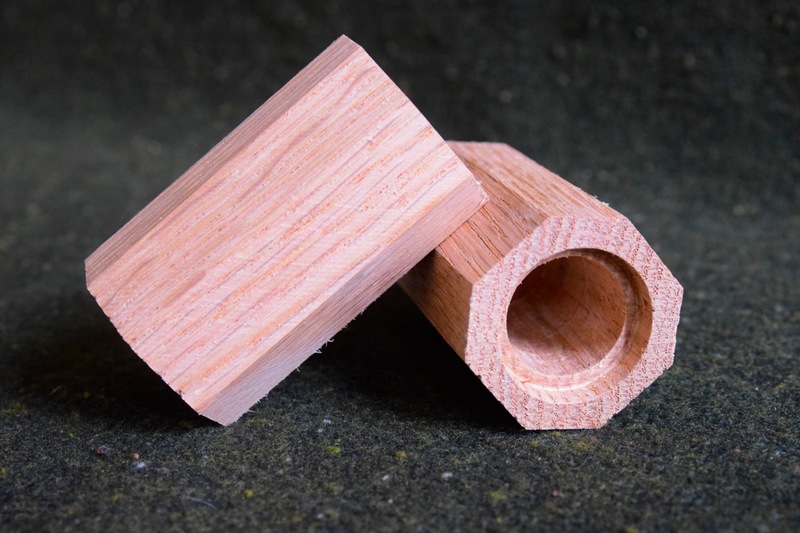 I regularly read the Popular Woodworking Shop Blogs. Interesting, informative and good reads all. There is one series that confuses and confounds me, the Bench Bull blogs by Yoav Liberman. I read them and am not certain exactly what I would do with one if I built it. Mr. Liberman’s Bench Bull in one of its iterations. One iteration of my Bench Bull. I have more money invested in the black pipe. I already owned the clamps. Many blog commenters are excited about building and using their Bench Bull, so it must be me. Megan Fitzpatrick, the editor and content director of Popular Woodworking Magazine, hired Mr. Liberman. Ms. Fitzpatrick is a friend of mine. (We once rode an escalator together at a Woodworking in America. She gave me a pleasant smile while coyly hiding her pepper spray.) She knows what she is doing and I trust her. I had some concerns when she first hired Chris Schwarz. He seems to have worked out for all the longer he was there. It takes all kinds. All this interest in the Bench Bull rekindles my interest in the Milkman’s Workbench. Chris Schwarz first wrote about it in his PW blog of Sept. 11, 2012. 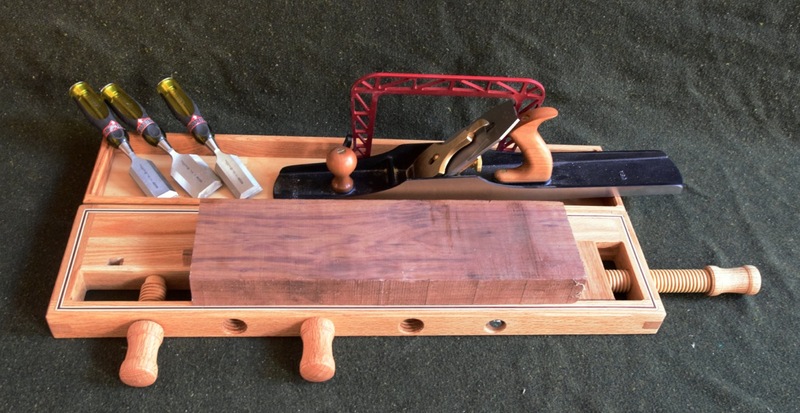 His Popular Woodworking article surfaced in the June, 2013 issue. I wanted to build the workbench since I first read his blog. 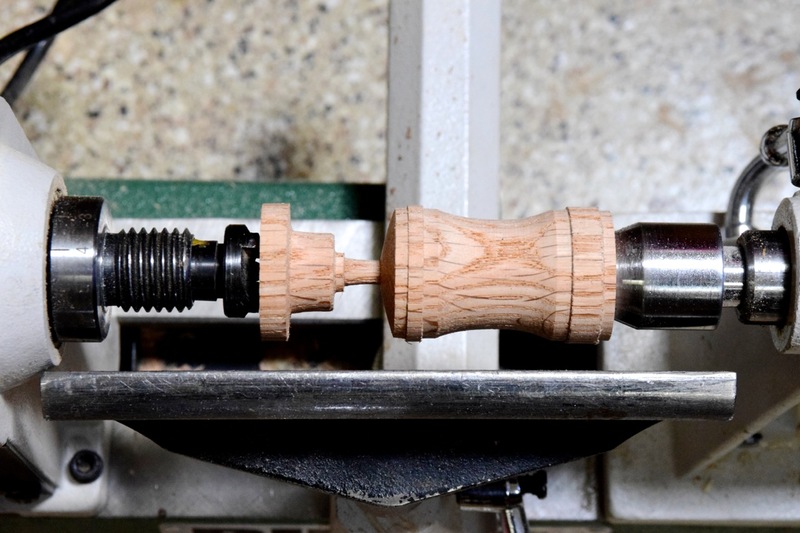 When his article came out, I went as far as buying the Beall wood threading/tapping system. Then, as often happens, it got shelved for a while. In this case, two and a half years. Mr. Schwarz built his workbench with square bench dogs but allowed that it round dog holes would be acceptable. Not being able to decide which to build, I built both. Round and square dogged workbenches. My need for the benches didn’t change, my justification/rationalization did. 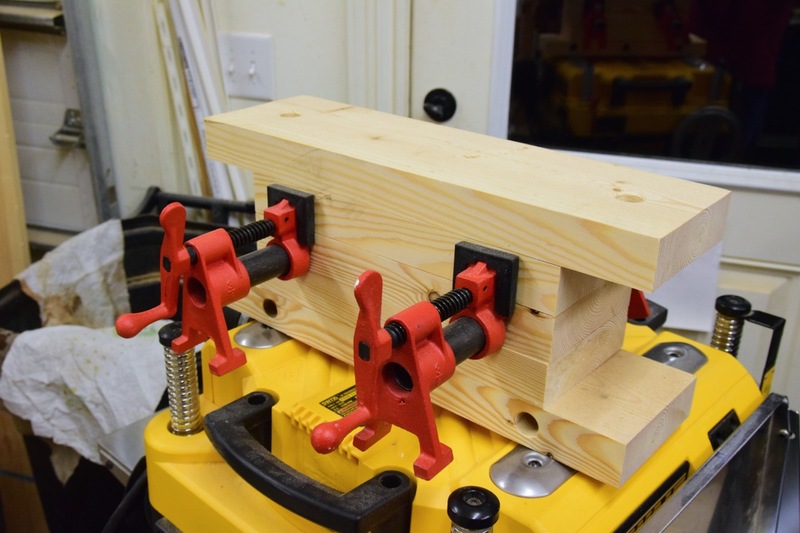 I initially drilled holes for 1/2″ round bench dogs but considered all the dogs and accessories available for 3/4″ holes and replaced the middle benchtop with one drilled for 3/4″ bench dogs. The left-handed workbench for all our sinister friends (original definition). I did do a few things differently. It was recommended that you turn the dowels to be threaded from square stock. I bought a commercial dowel and turned it down slightly to the proper diameter. A bit faster and certainly more uniform. Know your limitations and do what works for you. Another thing I did was to drill the holes in the handles while the blanks were still square. It is easier to hold the handle while square and centering the hole is less of an issue. Drilling the handles while square is faster. I added a shoulder to hide the rough thread end that occurs when you first thread the dowel then turn the threaded ends down to the necessary diameters. On the visible ends, I used a chisel to smooth the transition. I turned the handles using a 60° cone live center. This guarantees that the hole is centered. The cone live center centers the handles on the hole. My handles are longer but that is just personal preference. Don’t get excited, it’s optional. I know not all favor the tool tray. They say it is unnecessary and just exists to collect debris. I am currently neutral on the tool tray and just offer it as an option. I found some small ball catches at Woodcraft that adds a bit of friction to the square dog, encouraging the dogs to stay where you left them. Good dogs. The article has you using 2″ pieces of angle iron as hold downs to clamp the workbench to a surface. I don’t have any 2″ angle iron, I don’t like working metal and I just know that a sharp corner of the angle iron will at some point impale itself into my right thigh. Based on personal experience. As soon as I remember to buy some, I am going to use some sturdy hinges backed with cork or other non-slip material for clamping to protect the clamped to surface and my thigh. 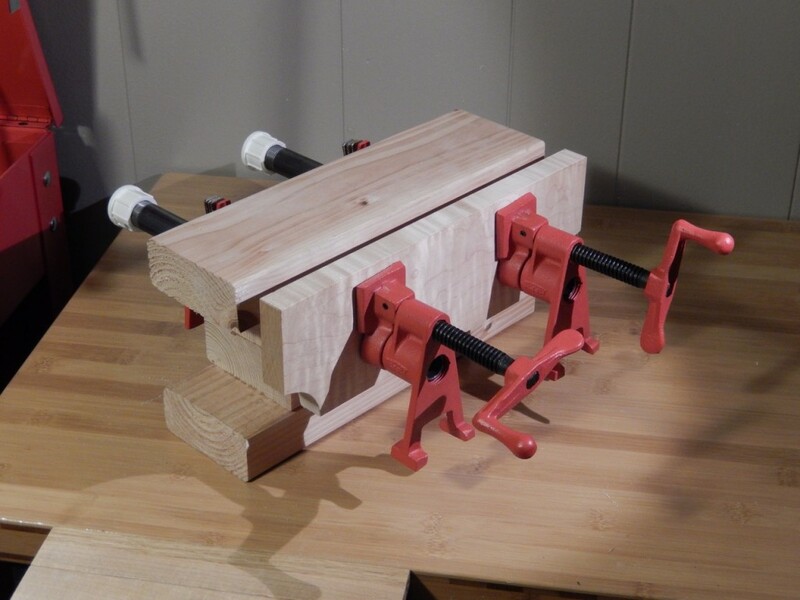 The hinges can be folded up when not in use making woodworking just that much safer. Cautionary Tales from the Shop. I offer these in the hope that you might avoid the same or similar mistakes in your shop. It is true that you learn from making mistakes, they can be annoying and slow your progress. Be aware of where your screw goes. There are no highly detailed, full-sized drawings for this workbench. We shouldn’t need them. We are woodworkers and should be able to figure many things out for ourselves. That being said, I placed a screw holding the right frame end to the middle benchtop incorrectly. 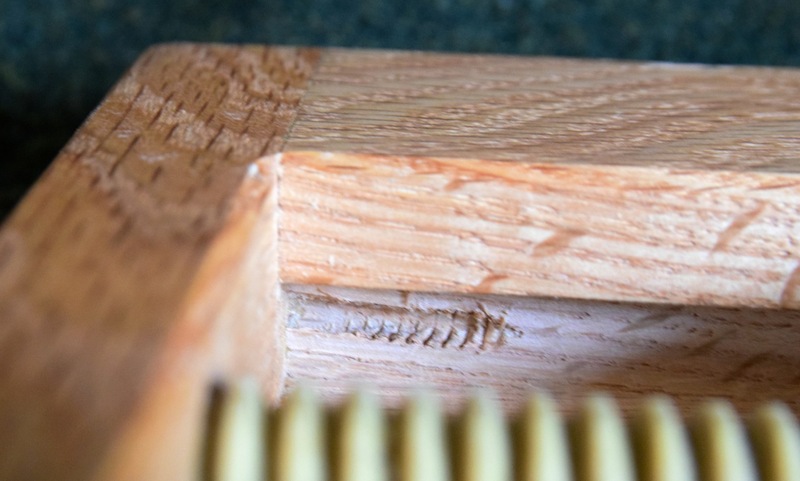 The screw surfaced in the vise block groove. This is not good. It interferes with vise block travel. The screw has been removed for the purpose of this illustration. I plugged the screw hole and moved the screw back about 3/8″. I clocked the screws. Another bold experiment on my part. 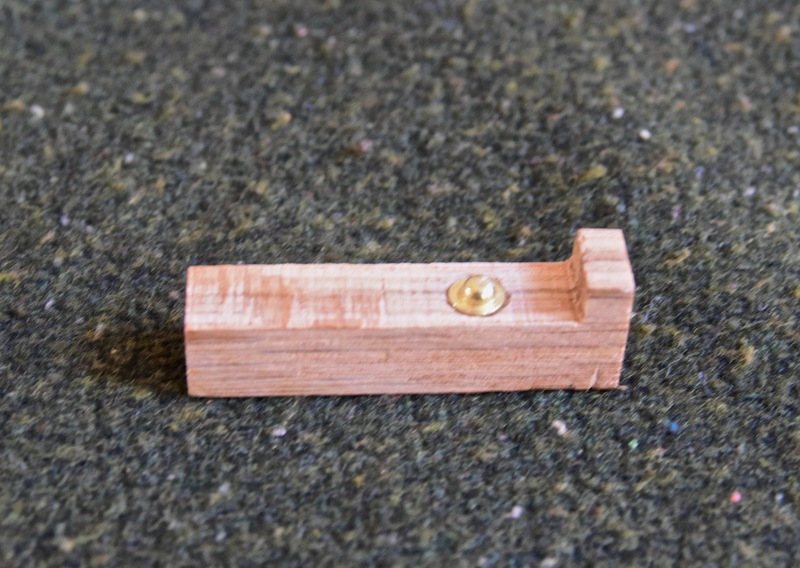 Next, to mark the hole for the vise block to accept the wagon vise screw, one is to dry fit the bench and run a 1 1/8″ Forstner bit through the tapped hole in the right frame end and bang lightly. Not having a 1 1/8″ Forstner, I used a 1 1/8″ spade bit that I did have. While theoretically possible to use the spade bit to mark centers, I was not a skilled enough woodworker to pull it off. The holes were not well centered and bound. 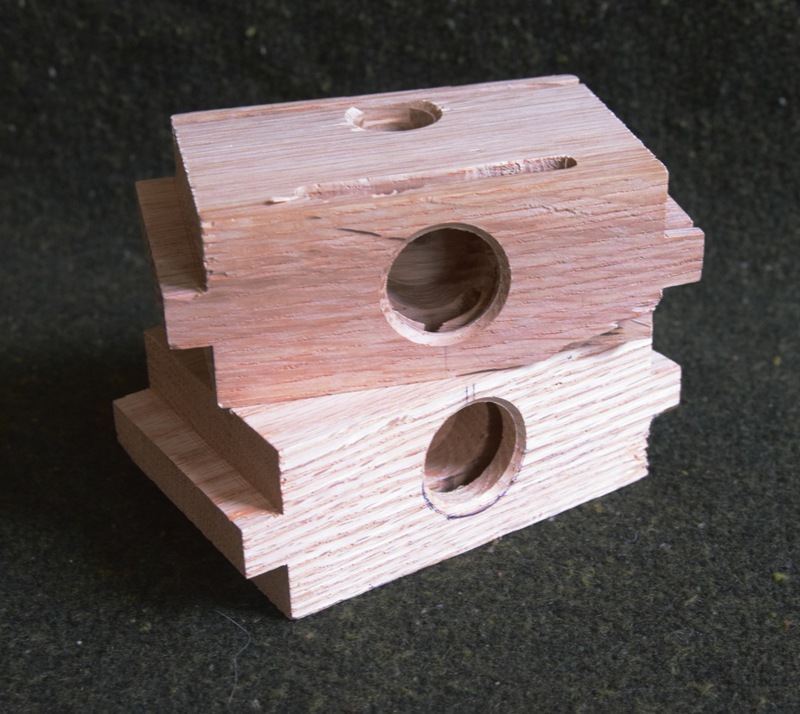 Two of the four rejected vise blocks. Two more had different issues and were cut up and used for experimentation. Using the Internet, I was able to locate the last local 1 1/8″ Forstner bit at a Lowes about 15 miles away. Not one of the more common sizes. Roadtrip! The last error of note was tapping the hole on the right frame end about 1° to 2° off perpendicular. This is not a problem when the block is close to the frame end (as when I did a dry fit) but becomes a major problem near full extension. The screw and block bind. The only fix I saw was to further reduce the diameter of the screw within the vise block. Back to the lathe. The good news is that I am now comfortable with my woodworking skills and not bothered by having to go back and remake parts when necessary. Annoyed by the need to but not bothered. There was a time when I doubted my ability to make a suitable replacement part, just being thrilled that I made it at all. I am now the owner of two Milkman’s Benches and a Bench Bull, none of which I have any immediate use for. Any and all suggestions entertained. Like Yesterday’s But In Wood. Today we feature pulls/knobs of wood.All that brass stuff will come later. I might do porcelain pulls if I can find more than four. I believe the medallion is applied. I wonder if it is original? Different knobs on different levels. I don’t think those casters would work well on shag carpeting. A replacement but maybe closer to the original. The typical evolution of hardware, from knob to bail pull. Was the knob installed as part of a restoration or just personal preference? Looking at shops and auctions , I wonder if any of the hardware is original. I observed at one auction that a collector had replaced most of his/her hardware with the same low-end pulls. It doesn’t make sense, but as been established, i am not a collector. Recently auctioned. I didn’t buy it. Or even bid. What interests me is the pattern of holes around the pulls. What was there? There is the same pattern around the doors on the lower section. Was there some form of hasp or other locking mechanism? Was it original? Are these knobs part of a restoration? Who knows. Is a puzzlement. To see the set (or Album as Flickr calls it), click HERE. I Think This One is Old. The last time I saw Peter Follansbee, he asked me when I was going to share pictures of some old things? He has a point. Whereas some youngsters might consider Mid-Century modern as old, Peter thinks more in terms of 17th century as contemporary. Most of the furniture I stumble across is late 18th and 19th century. I see plenty of 20th and 21st century furniture but I tend to ignore it for the purposes of this blog. There are a few interesting (to me) modern pieces but not many. This chest has been at the localest (most local?) antiques malls. It was buried deep in the middle of a cluster of furniture and has slowly been working was out to the perimeter. Now that its free, I can get some pictures and a blog out of it. No dovetails or framed panels. Boards in to grooves. Looks like hand work to me. Some grooves run a bit long. Tusked tenons holding the lid together. I don’t think they are the original wedges in the tenons. Interesting. I’m open to any explanations. Right side, as originally built or repair. There it is, low on the front. Held in place by the taper of the tenons on wither end. Still looking for more old stuff. *Peter Follansbee specializes in 17th century period joinery and green woodworking.Peter Follansbee specializes in 17th century period joinery and green woodworking. He spent over 20 years making reproduction furniture at Plimoth Plantation, the living history museum in Plymouth, Massachusetts. In addition to teaching the craft at schools around the USA, Peter co-authored the book Make a Joint Stool from a Tree: An Introduction to 17th Century Joinery” with Jennie Alexander. I was recently asked if I was trying to corner the market for Thomas Day game tables? Why did I need four Thomas Day game tables? Obvious answers: too much time and money, no impulse control. While true, it is not the whole truth. Thomas Day was/is a compelling person. He was a third generation free man of color and the largest furniture maker in pre-Civil War North Carolina. And a slave owner. You can read an NPR article about him HERE. I saw an alleged Thomas Day game table on eBay and watched the auction. Reasonably priced but shipping was high and I had no way of knowing if it actually was as claimed. Auction ended with no sale. I watched it on its next listing. And again on its third. I took time to read the listing and realized the table was located within five miles of my house. I contacted the seller to see if the table was going to be offered again. He responded that he was done with eBay but there was a woman from South Carolina coming to take look at it. He said I was free to come look at it if I wanted. I wanted and scheduled a visit inviting my friend, Jerome Bias, to come view it with me. We came, we saw, we were skeptical. The seller was quite insistent and knew all the right people in the collector community. We talked and turned the table every which way to look for evidence either way. In the end, Jerome’s skepticism lost to my desire to own. A price was negotiated and the table followed me home. The lady from South Carolina, if she existed, never made an appearance. A few weeks later, I took the table to Martin O’Brien, a highly respected conservator of furniture in Winston-Salem. We stared and talked for a while. His belief is that there is very good chance it is a Thomas Day piece. Or he said that hoping that he could make this fairly large odd person go away. I found the second table in Hudson, NC. I took lots of pictures and compared it to the first. There were more similarities than differences. I thought about it for a few weeks but finally gave in to the paranoia that it might be bought by someone who didn’t realize what it might be. I drove back to Hudson and acquired it. The dealer was having a sale. I paid substantially less for this one than the first. The first wasn’t that expensive to begin with. Jerome told me about the third one at a Greensboro antiques mall. I picked it up while driving back from Martin O’Brien’s shop. I was there to allow him to examine the second table. We decided the second was likely a Day piece. The mall gave me 15% off for paying cash for the third. I paid less for the third one than the second. The fourth one was at a large antiques mall in Burlington. Again, many of the same features as the first three. The dealer had marked it down so, once again, I paid less than for the third. I own these four with the intent of offering them up for study. I would like to work with a group or museum to offer the chance to study them with other known pieces of Day furniture. See the evolution of design and construction, techniques and materials. A chance to learn more about early 19th century furniture. Eventually, I want to find a home for the tables. Give others a chance to see and study them. They need to go. Eventually. We have a large house but it’s not infinitely large. I have no intention of becoming a Thomas Day hoarder. One thing I have learned is that Mr. Day’s method of foot attachment is subject to failure. 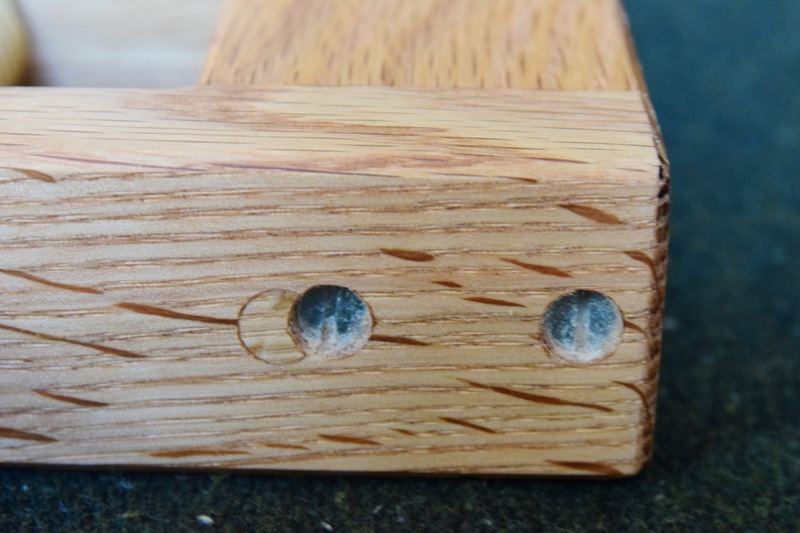 He makes a load bearing joint from an end-grain to end-grain glue joint reinforced with a single dowel. A repaired joint. Just not well repaired. Hanging in there by a dowel. On the other hand, the tables have survived for over 150 years. How long should a joint last to be considered a success?